Currently, there is no universally accepted standard media or method for the recovery of Campylobacter species. This is likely due to the ubiquity of the organism in nature, the complex sample matrices from which the organism is often recovered, as well as the fragile/viable-but nonculturable state the organism assumes in response to stress. 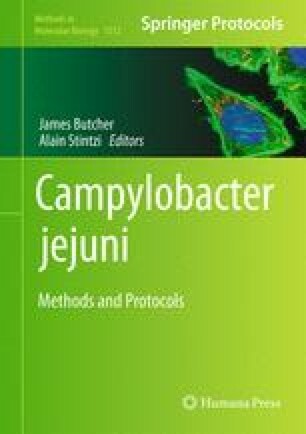 The use of a sterile filter placed upon a nonselective Brucella Agar Blood Plate (BAB), followed by incubation at 37 °C in a hydrogen-containing atmosphere (Campycheck), is one method to recover stressed and emerging Campylobacter spp. from complex environmental matrices; however, this technique does not currently allow for the enumeration of the recovered organisms. Enumeration is performed using serial dilutions of sample homogenate plated onto modified Campy-Cefex media followed by incubation at either 37 °C or 42 °C in a microaerobic atmosphere.